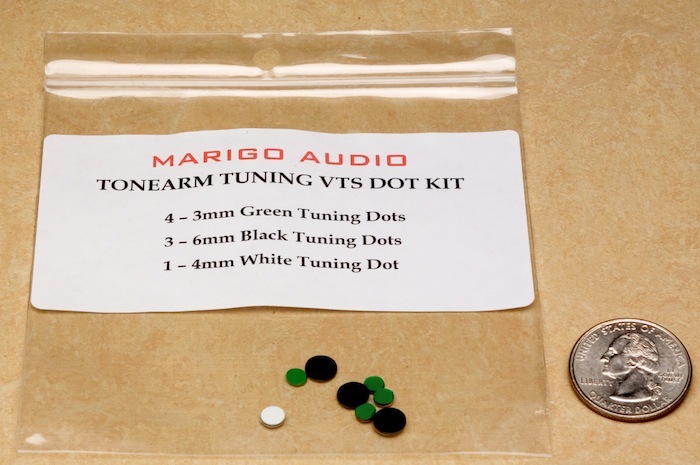 Marigo’s VTS Tuning Dots have been one of the most effective and dramatic steps I have taken to improve my system’s performance. The improvements were not sublte. They brought great transparency without losing musicality. Clarity, dynamics, inner detail, midrange bloom, bass slam and articulation have such an improved sense of openness that they represent a major paradigm shift in resonance control. Using the Dots on my speakers wrought a greater improvement than any cable or component swap I’ve made in recent years. I was hearing a fantastic transformation. 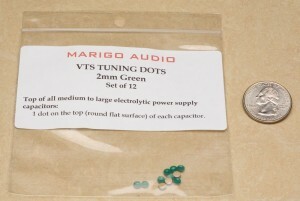 Application of the VTS Tuning Dots to the window behind the listening seat. This is a large window measuring four feet by eight feet. Improvements in soundstage dimensionality and image clarity were readily apparent, as well as the removal of harmonic smearing. Clean window surface where tuning dots are to be applied. • Remove liner from back of one tuning dot. • Apply tuning dots, one dot in each corner, as shown in the diagram to the right. Hold backing or dot tightly into corner of glass, and apply tuning dot to the glass immediately in front of the backing. • Large windows benefit from utilizing the new VTS SuperDots. • Small windows are fully treated with the new Series II Dots. • All windows within the listening environment must be treated for proper performance. • Windows in open adjacent rooms can also be treated for maximum performance. Black , White , and Green designations represent three unique formulations for the 2mm thru 6mm VTS Tuning Dots. Do not substitute a different Dot formulation from that specified in the following applications. 40mm Super Dots and 40mm Series II Dots are available with a cosmetic color choice (black or white) to match décor. Please specify. 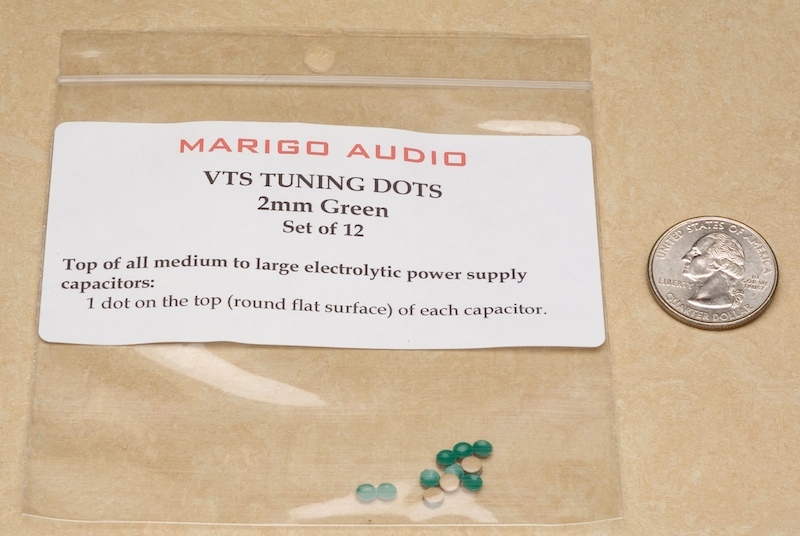 VTS Tuning Dots may be ordered to the exact quantity needed. Warranty is unconditional with lifetime free replacement as needed. Prices effective January 2004. NOTE: Do NOT add board dots if applying dot treatment to all applicable circuit devices. NOTE: Please specify white or black cosmetic Dot color.